With this much stuff for this price, it's hard to say no. A huge selection of quality samples. Not the best sound quality. 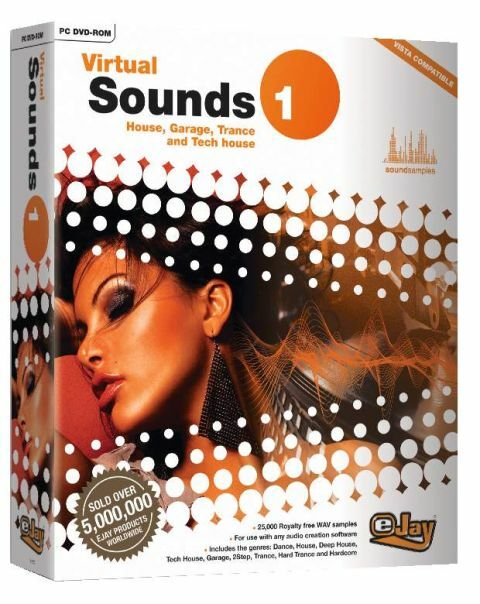 From the company best known for their eponymously-titled 'instant' music programs, Virtual Sounds 1 is aimed not only at the eJay faithful, but also at those using any other sequencer on Mac or PC. It comprises a 'greatest hits' collection of 25,000 WAV-format samples taken from a representative section of eJay's back catalogue (Sound Collection 1- 5, Sound Selection 14, Dance 6, Hiphop 5 and Techno 4). These include guitars, drum loops, bass (which we were particularly impressed by), vocals and keyboards. There are even some samples courtesy of techno king Carl Cox. The samples are straightforward WAVs, which means they can be used in any DAW or loop-based program. Some may argue that there are better quality sounds around, but this massive collection spans two DVDS and at a shade under 20 quid is tremendous value for money. It's perfect if you're looking to get your sample library started or want to branch out into other styes of music without spending a fortune.